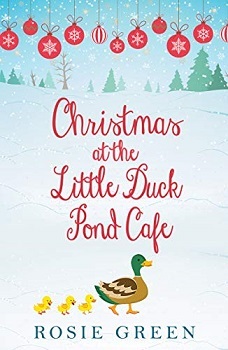 We return to the Little Duck Pond Cafe in this Christmas novella of the fabulous, heart-warming series. This time the story is told from shy and reserved Fen’s point of view. Fen has always been an introvert, preferring to stay in the shadows. However, when the gorgeous Ethan Fox comes to town playing Mr. Darcy she is in love. She even decides to join the local Amateur dramatics group, of course, this is where Ethan goes too. Fen is completely smitten and over time you start to see her come into herself. Someone has also put her name forward for a baking competition, but will she agree to take part? In other news, little Maisie’s mum has returned after a four-year absence. Ellie is upset that the little girl she has come to know as her own daughter will no longer want her. She also wonders why her mum has returned and what she really wants. There is so much going on in the village that you won’t believe that this is just a novella. The book was completely and utterly engaging and I sat and read it in one sitting. If you haven’t read the other books in the series – Why Not!!. Now is a good time to catch up. The whole cast are a delight and the cafe is in the heart of the village and the food and hot chocolate drinks make you salivate. The book gives you that warm and fuzzy feeling inside and would make a great addition to your festive reading. This book, or novella rather, sounds delightful. Glad you enjoyed it. It has been a great series and this one was brilliant. Yay, great I’m so happy you enjoyed it. I love sweet books like this. I’ll have to check it out. Make sure you check out the whole series too. Seems like a cute and cozy read. I’m looking to build my holiday TBR and will keep this one in mind! Great review. Great, I would definitely add it to my TBR list. I don’t usually read holiday books but these look cute and cozy! Thanks for sharing! Great review Stacey, this book looks and sounds really an amazing and fun book I really love the cute cover on the book as well. Thank you so much for sharing your awesome post.